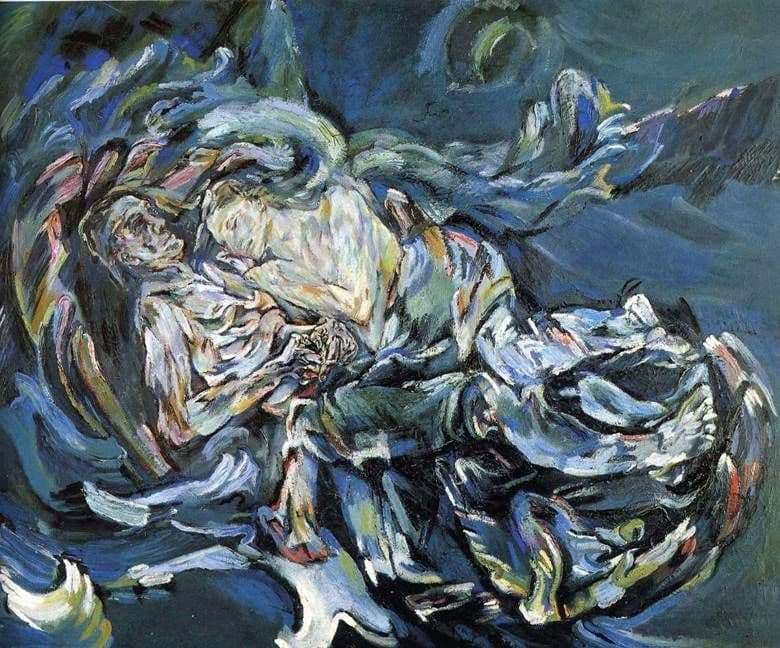 The famous work “The Bride of the Wind” by Austrian expressionist Oscar Kokoschka was created on canvas in oil in the distant 1914. She brought him unprecedented fame and at the same time disappointment in love relationships for the long years to come. Now the painting is in the Basel Art Museum. The picture shows two characters – he and she, and around the raging ocean of love. She laid her head on his shoulder. This is their last meeting. The artist himself and his beloved Alma became the prototypes of the images in the picture. The picture shows the contrast between the idyll of lovers and boiling water around. This gives the masterpiece even more drama. This makes it temperamental. In the color scheme of the picture is dominated by only cold colors. This allows the viewer to see the picture in full detail. The male figure in this picture is static, the female one, on the contrary, is full of love, life, tenderness and goodness. The author, using his creation, tried to convey the fullness of the experiences between him and the beloved: passion, jealousy, misunderstanding. The artist himself argued that this picture is fraught with eternal union and the inseparability of relations between men and women. He hoped that by writing a picture with such a plot, he would be able to return his real love. Alas, he was not destined to come true and he would never see her again, as he did not try. These two, like the heroes of “Titanic” after the shipwreck were in the depths of the ocean. The theme was really inspired by the terrible recent shipwreck events and the author’s own experiences. Their connection is inseparable despite everything, but it was only in his subconscious. He wanted and so imagined. Despite the fact that the picture did not like Kokoschka’s sweetheart, she was very popular and was immediately sold.